Thanks to a grant from Blue Cross Blue Shield North Carolina (BCBSNC), the UNC Center for Health Promotion and Disease Prevention (HPDP) has chosen the Rivers Agency as a creative marketing partner in an innovative effort to reduce childhood obesity. The focus is on what kids do and how they eat while in child care, especially children between the ages of 1 and 5. 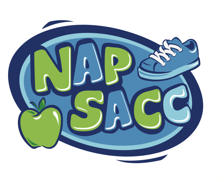 NAP SACC, Nutritional Physical Activity Self-Assessment for Child Care, was developed and tested by UNC researchers Dr. Dianne Ward, Ph.D., Christina McWilliams, and Amber Vaughn. With a new Rivers-produced interactive website, NAP SACC will be able to greatly expand its reach and effectiveness for kids. In 2010, the White House Task Force on Obesity recognized NAP SACC for its unfolding program. It’s been called a “nutrition revolution” that builds a culture of health within child care environments. No longer will NAP SACC face the constraints of a small staff unable to go out in the field to meet demand; the new site Rivers creates at HPDP’s direction will allow day care centers — including home-based licensed centers — to do more sophisticated self-assessments online, as well as get timely, state-of-the art-training and follow-up from virtual consultants offering expertise in child physical activity and nutrition. Exercise and eating healthy while in day care is an entirely different challenge than anti-obesity efforts focused on children at home or in school. With the extraordinary backing provided by the BCBSNC grant over the next three years, UNC’s HPDP team will soon be equipped to have the new virtual web site — and its virtual consultants — become vital elements in dealing with this dangerous trend for our children, in North Carolina and soon beyond. The target launch date for the site is December 2012. Here at Rivers, we are confident our web designers will create a site that invites and encourages plenty of involvement, functions seamlessly and makes a lasting difference. This is so CRUCIAL for children’s health- way to go for all parties involved! Sure makes sense to use the web for this purpose. Our younger kids need help on this front, and so do parents when they have to put kids in day care. This issue needs this kind of expert attention. Rivers Agency does such a great job.. Thanks! Your team is the Best! So glad you all can help with this issue. No doubt Rivers’ expertise will tremendously help with this wonderful cause.